Happy birthday to Ms. Moon Unit Zappa, author, actor and the eldest daughter of Frank Zappa. Then in 1982 Moon became famous at the age of 14 because of a wild novelty song called "Valley Girl" in which little Moon ripped to shreds the empty-headed chatter of her San Fernando Valley peers. But to the consternation of Zappa -- and his daughter-- across this glorious land teenage knuckleheads assumed the Zappas were celebrating Valley girl culture, not mercilessly mocking it. But those of us who watched the interviews it was clear that even as a teen, Moon had a similar deadpan, irreverent wit as her dad. Here they are on Late Night With David Letterman. Letterman basically begins the interview asking "You named your kids what????" "Valley Girl" wasn't her only song though. Here she is with brother Dweezil on a song she co-wrote with Steve Vai called "My Mother is a Space Cadet." Moon still has her understated humor and story-telling talent. Here's a recent appearance on Back Fence PDX where she talks about her quest to lose her virginity. It starts out funny, but ends up being a bittersweet, poignant tale. Moon Zappa at Back Fence PDX: MAINSTAGE from Back Fence PDX on Vimeo. Finally, here is a Hawaiian (!) parody of "Valley Girl" by a band called Da Mokettes & the Incredible Q Band. It's called "Palolo Valley Girl." What better than a novelty record than a novelty record of a novelty record and that is what we have here. Some Hawaiians lead by Will Moku take Frank & Moon Unit Zappa's Valley Girl and infuse it with some local lingo and slap some local geography on it and ta-da Palolo Valley Girl. Did a little digging around and found some info that makes some sense of this record. Will Moku was a popular dejay (real name William Saragosa, died in 2004 at the age of 47) and guitarist. 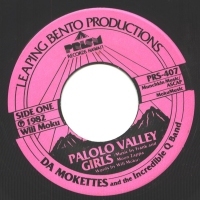 He had a 13 year run at KQMQ, where he came up with Palolo Valley Girls. Surround yourself with enough novelty records and pretty soon you figure out that most of them are done by disc jockeys. And that is really all I have to say. But this only begs the question: Why didn't anyone in New Mexico write a spoof called "Espanola Valley Girls"?